Don't confuse this element with barbar-, meaning "foreign". 1. One of the parallel filaments projecting from the main shaft of a feather. 2. A subsidiary point facing opposite from the main point that makes an arrowhead or spear hard to remove. 3. The pointed part of barbed wire. 4. From Old French barbe, "beard, beardlike appendage"; from Latin barba, "beard", cognate with Old English beard. 1. Red beard, a famous name from several historical situations. 2. A famous barbary pirate who died in 1546. 3. The Holy Roman Emperor from 1152 to 1190; conceded supremacy to the pope; drowned while leading the Third Crusade (1123-1190). 1. A reference to a bearded condition or relating to unshaven hair on the cheeks and chin: Jane could describe the face of the burglar as being barbate with stiff gray whiskers. 2. In botany, plants that have long stiff fibers: Such plants, like oats and barley, have hairlike structures and are described as being barbate grains. Go to these pages about Beards: Historical Presentation AND to Hair and Beard Styles from the 14th century to the 7th century B.C. so you can see much more about beards. 2. Bearded; barbed or spiky. 1. A slender tactile process on the lips of certain fish; such as, catfish and cyprinoids. 2. A large European fresh-water fish (Barbus fluviatilis), with four barbels on its upper jaw; also, any of various other species of Barbus. 3. Barbs or paps under the tongue of horses and cattle. Referring to short, stiff, hooked bristles or hairs. A very small barb or bristle. 1. Someone whose business is to cut hair and to shave or trim beards. 2. Performing the services of a barber; such as, cutting hair and/or beard of individuals. 3. Originally, barbers were also regular practitioners of surgery and dentistry and were often called barber-surgeons; however, they were restricted to haircutting and dentistry under Henry VIII. A history page about barbers and barber poles. 1. A bird of the family Bucconidae, allied to the Cuckoos, having a large, conical beak swollen at the base, and bearded with five bunches of stiff bristles; the puff bird. It inhabits tropical America and Africa. 2. A variety of small dog, having long curly hair. 3. 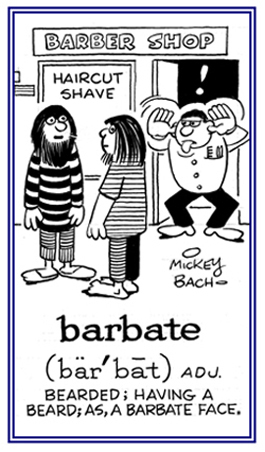 Etymology: from French, a diminutive of barbe, "beard". A reference to a beard or beards. Relating to bearded or hairy. 2. One of the processes along the edges of the barbs of a feather, by which adjacent barbs interlock. 3. A small barb or pointed projection, especially one of the small projections fringing the edges of the barbs of feathers.